Netflix told the FCC that calls made to its customer support center about slow-loading videos on Comcast's network more than quadrupled late last year. Why did Netflix pay Comcast to stream its videos faster? Because Netflix was losing customers. That's according to a petition Netflix filed to the Federal Communications Commission this week in opposition to Comcast's (CMCSA) proposed mega-merger with Time Warner Cable (TWC). In February, Netflix reluctantly agreed to pay Comcast to directly connect to its network. Prior to the direct connect, Netflix delivered its videos to Comcast customers via third parties, including Cogent Communications (CCOI). But Comcast customers experienced abysmal Netflix speeds -- among the worst in the country. Netflix speeds became so slow in December 2013 and January 2014 that customers grew irate, Netflix said in its petition. 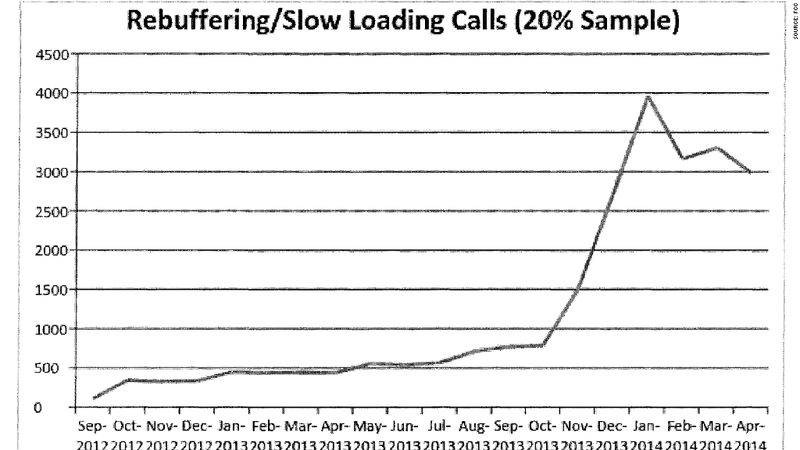 Calls made to Netflix's customer support center about slow-loading videos more than quadrupled during those months. "For many subscribers, the bit rate was so poor that Netflix's streaming video service became unusable," the company said. "Some of them canceled their Netflix subscription on the spot, citing the unacceptable quality of Netflix's video streams and Netflix's inability to do anything to change the situation." "We had to do something to make the congestion stop," the company added. After its February agreement, Netflix speeds have soared on Comcast's network. The company has since entered similar deals with AT&T (T), Verizon (VZ) and Time Warner Cable. Netflix and its CEO Reed Hastings have become outspoken critics of those direct-connect deals, accusing the Internet service providers of shakedown tactics. Writing in Wired last week, Hastings said that Internet users will "never realize broadband's potential if large ISPs erect a pay-to-play system that charges both the sender and receiver for the same content." He has called on the FCC to ban broadband companies from charging content providers like Netflix to connect to their networks. The Internet companies counter that Netflix plays an outsized role in network congestion, accounting for around a third of data consumption online during peak hours, and Netflix should therefore help foot the bill for delivery.